MN27: 12v Alkaline battery for remotes, keyless, etc. Cross-reference part #s G27A, A27, GP27A, AG27, L828, 27A, R27A, 27A, V27GA, 8LR732, L8218, MS27, etc. Size: 28mm long x 7.7mm diameter (1.1" x 0.3"). This is a Primary battery (i.e. non-rechargeable). AG5 (LR754) : 1.5 volt alkaline button battery. Replaces AG5, SR754SW, V309, S754S, SG5, AG5, 70T, 309, SR48. AG4 : 1.5 volt Alkaline Button battery (for watches, timers, memory). Cross reference part numbers include 376, L626, SR626W, 619, MA, SR66. AG8 : 1.5 volt alkaline button battery. Cross reference part #s 381, 391, SR1120SW, V318, S1131S, L1131, SG8, 317, 280-27, SB-AS/DS, SR55. The LR44 is a 1.5 volt alkaline button battery. Size is 11.2mm dia x 5.2mm tall. X-ref part #s are CR44, SR44, 357A, SR44W, AG13, G13, A76, A-76, PX76, 675, 1166a, LR44H, V13GA, GP76A, L1154, RW82B, EPX76, SR44SW, 303, SR44, S303, S357, SP303, SR44SW. 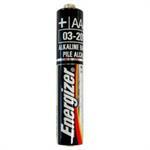 Energizer AAAA: 1.5 volt Alkaline AAAA battery E96. Primary (non-rechargeable) alkaline cell. Dimensions: 42.5mm long, 8.3mm diameter. 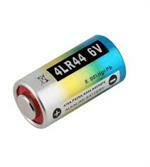 4LR44 : 6 volt alkaline battery 476A, PX28A, A544, V4034PX, etc. The 4LR44 is a 6 volt Alkaline battery - GP brand. For multi-purpose applications (memory, cameras, toys, remotes, dog collars, etc.). Replaces # 476A, A544, PX28A, PX28AB, V4034PX, A28PX, L1325, and more. Battery is 1" long, and approx. 1/2" diameter. A23 : 12 volt Alkaline battery. Size: 28.5mm long, 10.3mm diameter. Cross reference part #s 23A, 23GA, A23, E23A, GP-23A, GP23A, K23A, L1028, LR23A, LRV08, LRVO8, MN21, MS21, V23, V23GA, VR22, 1811A, VA23GA.